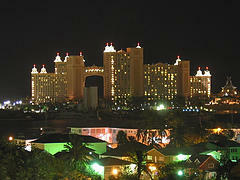 What is the Atlantis Resort Bahamas? Atlantis Paradise Island Resort is a resort hotel which caters to everyone: singles, couples, and families. Located on Paradise Island, Bahamas, near Nassau, the theme of this flawless property is that it is the legendary island from Plato's dialogues Timaeus and Critias: Atlantis. The Atlantis Resort Bahamas is one of the most beautiful resorts we have ever seen. The resort combines the best of the Caribbean beaches, a beautiful hotel, a huge aquarium, and an outstanding amusement park. 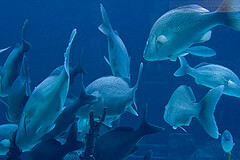 In fact, the aquarium at the Atlantis Resort Hotel and Casino is the world's largest open air aquarium. At over 34 acres, it has 200 species of exotic and beautiful sea creatures spread over more than 10 lagoons, pools and aquariums. There are a wide variety of colorful tropical fish, sharks, graceful rays (mantarays and stingrays), jellyfish, turtles, spiny lobsters, moray eels, and much, much more! White Powder, Caribbean Islands Style! If you are like me, you hate the cold. As Jimmy Buffett once observed, "[I] got a Caribbean soul I can barely control..." So if I see any white powdery snow, it is going to be the Caribbean islands version. The beaches surrounding the Atlantis Paradise Island Resort are some of the best beaches around. White, sugary sands provide a stunning contrast with the crystal blue-green waters. The hotel's main beach, Atlantis beach, literally goes on for miles. As a hotel guest, you are provided with a complimentary lounge chair to enjoy the sun and the sand. Many of the lounge chairs have a personal canopy that provides shade for the chair, but these go fast, so you have to get there early to get one of these "shaded" chairs. Guests to this Paradise Island, Bahamas resort can enjoy that of various water activities, including white sand beaches, multiple swimming pools, a lazy river, large kiddie pool with waterfall and water slides, and much, much more. The Atlantis Paradise Island Resort in the Bahamas has giant water slides that take off from a six-story Mayan Temple. Called the "Leap of Faith", this 60 foot vertical drop ends in a clear tunnel surround by a shark filled lagoon! The ripples kiddie pool is a large area with slides, waterfalls, and other fun features, as well as ample room for lounge chairs for the parents. For families traveling with babies, you get a special kit with a night light, lullabies and more. There are a few things that you should consider when planning on staying at the Atlantis Paradise Island Resort. The grounds are immense, so, particularly if this is your first visit to the resort, we recommend using a map to help you navigate the resort's facilities and outstanding attractions. Also there are Harborside Villas that can accommodate larger families. There are frequent shuttles to take guests to the Atlantis proper. You can walk from the villas to the Atlantis campus, but this walk can take up to ten minutes. Also, as extravagant as the facilities are, this is not an all inclusive resort. This means that food and drinks cost extra. The meals and refreshments can relatively expensive, so you should bring a little extra money in addition to what you would normally bring for souvenirs. Overall, remember to have fun, and also remember that proper planning of your trip to Atlantis Resort Bahamas will allow you to be fully satisfied in the end, and make sure that your trip is as much fun as it possibly can be.